Assassins in the employ of royalty would be the best killers in the realm should they have existed. Those are nothing but rumour and hearsay to the common citizen. Ofcourse, the presence of such individuals and the sinister purposes they got employed for are rather best kept in the dark. To that end, its not unknown for them to receive an position of office in the royal house alongside an new identity that would aid in concealing their true purpose as they meet and deal with the spymasters of the crown. Each of those sinister individuals is a death machine whom has got countless assignments done under its belt prior to ascending to this position. Those who attempt to wiser their liege find themselves an dagger planted in the back, those who fail their assignment are lucky to have a shallow grave to lay in. Due to the dangerous nature of an assignment that warrants the deployment of an royal assassin they receive additional training in the various fields of subterfuge and combat from masters of the realm. One technique they learn is that of an secret spell that is taught by the chromatic order. This spell allows them to teleport right at the back of their target, mostentimes allowing for an easy kill before the target can even react to the presence of the Royal Assassin. The way an Royal Assassin fights is an art, nothing less than awe-inspiring. 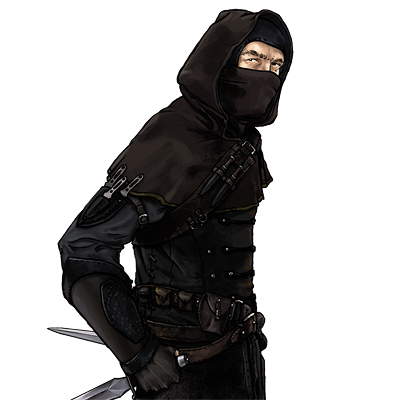 The Royal Assassin operating from out the shadow combines his prowess with his training to get the deed done and longst gone before his presence had got to be known. Special Notes: This unit’s skill at skirmishing allows it to ignore enemies’ zones of control and thus move unhindered around them. This unit is able to hide at night, leaving no trace of its presence. This unit has an attack that has 3% chance per level difference to instantly kill an enemy unit. If there is an enemy of the target on the opposite side of the target while attacking it, this unit may backstab, inflicting double damage by creeping around behind that enemy.This unit has an attack, that if hits can be used to get behind the enemy. This unit’s marksmanship gives it a high chance of hitting targeted enemies, but only on the attack. The victims of this unit’s poison will continually take damage until they can be cured in town or by a unit which cures.